The shire was named after Alfred Deakin, Victorian Parliamentarian and chair of the Royal Commission on Irrigation (1884). 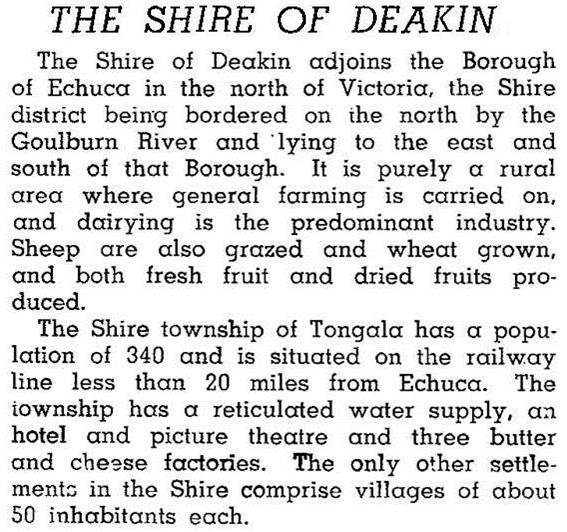 Deakin introduced legislation for State-aided irrigation trusts, which ultimately led to the early irrigation works in the Deakin Shire. The shire was based on the area covered by the Echuca and Waranga Water Trust. In 1994 three quarters of the shire's 961 sq km were farm land. There were 81,000 dairy cattle, 19,000 meat cattle and 31,000 sheep and lambs. On 18 November 1994, Deakin Shire was united with Echuca city, Kyabram town, most of Rochester and Waranga shires and part of Rodney Shire to form Campaspe Shire.